OFM, Inc. is a respected provider of high quality modern office furniture for the home and business. In addition to reception desks and industry leading office cubicles, OFM provides a host of multi-purpose tables perfect for lounge, reception, bistro, and cafeteria use. That being said, this new article highlights the hottest selling OFM tables for your business. Enjoy! First up, the MT36RD. This round multi purpose table features an elegant mesh base that showcases a contemporary style. This 36" round meeting table looks elegant in both lunch and meeting rooms and looks great with matching model 310 stack chairs to compliment the modern look. The banding makes the edges smooth and gives it a finished appearance. The honeycomb core makes the table both lightweight and sturdy. Next up, the LT36SQ. This square top cafe table is an excellent value at $259.99. The 1 1/4" thick top is available in a choice of 4 in stock finishes and features a honeycomb core for a lightweight design. 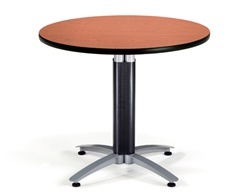 This sturdy bistro table makes an excellent addition to any multi purpose office environment. The table is easy to install, easy to clean, and built to last. At this price, you will be hard pressed to find a better deal for your business. In addition. LT36SQ tables are also available with bulk pricing for extra savings! 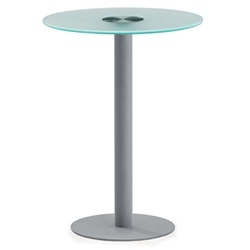 Bar height tables are extremely popular for modern interior design projects in 2013. Utilizing bar height bistro tables is an excellent way to provide your space with a hip look sure to resonate with visitors of any age. Tables like the NGT-2 Glass Reception Table by OFM provide a well rounded style that works great in any office area. In fact, this modern cafe table even works great in outdoor applications! Priced at only $185.99, this is the most affordable glass bistro table on the market and even includes free nationwide delivery. The NGT-2 is very easy to assemble, boasts a 1/2" thick tempered glass top, and ships in approximately 2 business days. Needless to say, this stylish table will earn your business a plethora of positive compliments! 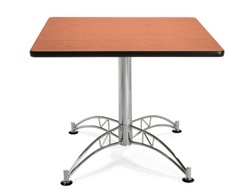 When it comes to the breakroom, a variety of popular office tables are available. Top breakroom tables from OFM like the FT36RD are consistently best sellers month after month by most every reputable office furniture provider in the country. This folding breakroom table features an elegant base that allows the table to nest for easy storage. The 1 1/4" thick high pressure laminate top offers the previously mentioned honey comb core that OFM is famous for in addition to 3MM edge banding. The FT36RD folding multi purpose office table sits 29" from the floor and even works great in meeting rooms. Units like this are becoming more and more popular as the need for modular conference tables and other space savings products allow for increased versatility in the workplace. No matter the line of OFM tables your decide to go with, you'll be making an excellent choice for your business. This quality brand is always a favorite amongst interior design teams and furniture professionals alike. The in stock status is always a plus for those in need of furniture quickly. The wide variety of frame and surface finish options allows you the ability to get creative with your space. With so many excellent style and space saving attributes it's no wonder why OFM furniture is a huge hit in 2013. Drafting tables are incredibly popular. Architects, artists, and crafting professionals all require a quality drafting table to get their jobs done effectively. 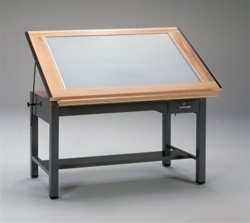 Often, the question is asked what makes a drafting table worthy of a professional title. With so many models available on the market today, it's hard to know which tables will work best for your individual needs. This article highlights the important traits and characteristics any high end drafting table should feature to help you make an informed purchasing decision. The first and most obvious trait of a professional drafting table is the price. While beginner models are available for around $250 from reputable brands like Studio Design, high end tables can range in the thousands. While this might sound like a strain on the average budget, the benefits and extended life span of a well made table is hard to beat. One popular model, the Ranger Drafting Table can be purchased for as low as $553.99 and is a real favorite amongst the architectural crowd. Secondly, a professional table for drafting should feature a durable top. While glass drafting table solutions look fantastic, a thermally fused laminate surface or metal top will last much longer. For this reason, the top of your table is one of the most important factors to consider when shopping. Architects and artists alike will often choose a lighted drafting table top as it provides excellent visual benefits and makes work a whole lot easier! Another important factor is the table base. High end tables should feature a four leg design. This post style approach promotes stability. While beginner drafting table models often showcase fancy leg designs that look great in home office environments, they don't bode well for every day use. Those intending to subject their product to daily use will want a rugged frame that ensures commercial grade craftsmanship. In most cases, steel and solid wood is preferred. Ergonomic adjustability is a trait that will surely keep you comfortable and working at your highest levels of productivity when drafting. While most tables offer some form of surface adjustment regardless of price and style, top quality models will offer a far greater range of movement. Height adjustable drafting table solutions as well as split top drafting table models are an excellent indication of this valuable trait. A tables adjustment capabilities provides versatility and a wide range of motions that should be tested before purchasing if possible. 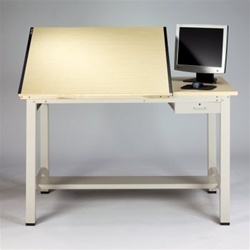 Several top drafting tables are actually rather difficult to adjust compared to others. Electronic options are available but will often drive up the cost of your table. Hand operated models typically work perfectly and leave a far smaller window of areas to breakdown over time. Lastly, any respectable table should come with a warranty. 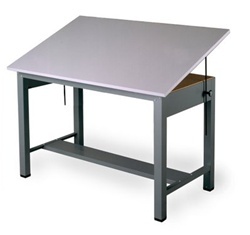 Any Mayline Drafting Table for example come with a manufacturers guarantee that keeps you protected throughout the life of your product. This guarantee provides security for your investment and should not be overlooked. While most brands will cover manufacturers defects, it's nice to know that quality manufacturers like Mayline provide extended coverage, replacement parts, and much more for your table. Opting to go with a preferred brand of this nature is always a smart choice. In the long run, testing a variety of professional drafting tables will ensure you get this best bang for your buck. Doing your homework will always save you money when shopping regardless of the products your interested in. No matter the table you decide to utilize, make sure to not overlook the efficiency improving details like ergonomic drafting chairs as well as flat file cabinets to keep you important documents secure and protected. Top online providers will be happy to provide bulk discounts, free shipping, and coupons for shoppers looking to outfit their entire work area. This little tip is an excellent way to save a bundle! With the first quarter of 2013 coming to a close, we thought it would be fun to highlight the hottest selling Mayline reception desks for your business. As with every room of the office, Mayline produces high quality products that should be considered for any upcoming makeover or interior design project. The top reception desk solutions highlighted in today's post are truly spectacular products sure to enhance your welcome area in a hurry and within budget! First up, the Brighton Reception Desk with an abundance of modern style! As the most affordable casegoods furniture line offered by Mayline, Brighton provides a lot for the money. This discount office furniture collection boasts matching executive furnishings as well as conference room components that provide for a well rounded an cohesive look throughout any business. The Brighton Reception Station is available in two stocked laminate finishes and comes standard with ample storage. The rear wall credenza configuration is included in several Brighton typical packages and is a must for any growing business. 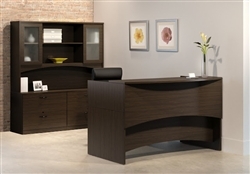 Next up, the always popular reception desk from the top selling Napoli Office Furniture collection. This luxury Mayline Furniture line is all about modern style. All of the 3 in stock wood veneer finish combinations are easy to appreciate and the glass transaction counter sets this station over the top. Units like this Napoli guest reception station work extremely well in contemporary welcoming areas and law office environments. 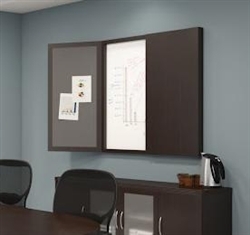 In addition, Napoli storage cabinet solutions are also available to assist with your office organization needs. Stylish modern coffee table and end tables are available to round out the modern theme. Third on our list of top selling Mayline Reception Desks is this hot model from the Luminary Casegoods Furniture collection. This L shaped reception station from Mayline comes standard with two desk pedestals for organization office storage. 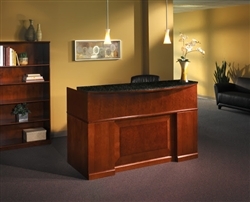 The Cherry and Maple finish selections showcase a traditional appeal that works well in almost any office environment. In addition, Luminary table desk configurations are also available to showcase this hot line throughout other areas of the workplace. If you like high quality reception furniture without all the frills of the modern look, the Luminary line is for you. The impressive simplicity provides unique characteristics often forgotten in the furniture industry. Coming in as the number 4 selection is this traditionally styled model from the luxurious Mayline Sorrento Furniture line. Sorrento reception stations have to be seen to be believed. The rich Espresso finish on Walnut veneer and granite transaction counters are a stunning combination. You will be hard pressed to find a finer solution at even twice the price. Available with optional counter organizers, this station is about more than just good looks. Ample office storage products are available as well as matching reception furniture with the same high levels of craftsmanship. Quite frankly, reception desks of this caliber often require long lead times or custom manufacturing. These in stock Sorrento Reception Desk solutions are the absolute best traditionally styled visitor desks for sale on the market today. For those in search of a less flashy and more affordable approach, units with wood transaction counters are also available. Last but certainly not least, the Mira Reception Desk in your choice of espresso or medium cherry wood veneer finish. 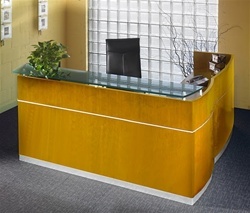 This line of modern reception desks works well in contemporary styled office environments. Mira's simple curves offer a well rounded look that's easy to love. All products from this collection including executive desks and even luxury conference tables are sure to earn your office a host of positive compliments. 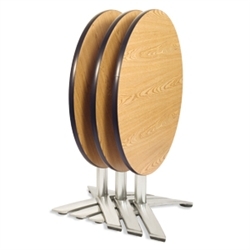 As an added bonus, Mira reception station solutions are amongst the most affordable in stock wood veneer models available. The quick shipping capability of this line is great for those in need of furniture in a flash! Needless to say the large and small reception desks available from the Mira line of Mayline office components are industry favorites that won't let you down. Are you familiar with the RFM Preferred Seating brand? 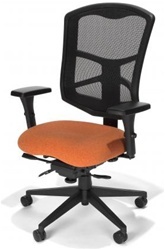 If you love modern style, ergonomics, and incredibly affordable office chairs, you should be! This industry leading chair manufacturer builds some of the hottest seating solutions on the market. RFM prides themselves on improving quality and functionality in the workplace. Enjoy these 5 reviews on our favorite RFM chairs for the home and business. First up, the 22011 model Verte Chair with out of this world style! This super modern chair is all about comfort! Imagine settling into a chair that molds itself to your spine’s unique shape. Inspired by the human vertebrae, the Verte combines ergonomics, form and function to produce the ultimate in seating posture and comfort. A decade in the making, the Verte Office Chair was created by a team of engineers, designers, and ergonomists, and is truly one of a kind. Sit in it once, and you’ll never settle for anything less. Next up, the Ray series RFM Executive Chair 5395 with headrest. The ray chair offers versatility and a variety of seat and back options to provide a personalized fit for every body. The enhanced lumbar and kidney cushioning areas support every region in your back to improve posture and reduce fatigue. The High Back option sports a fully articulating headrest for greater neck support.This high end executive chair is available in an extensive selection of fabric upholstery options sure to impress in any luxury office seating application you can think up! Third on our list of favorites is the Echelon Office Chair 1935Q with breathable mesh back design. This popular series has taken ergonomic seating to a new level of comfort. With its ability to comfortably accommodate people up to 300 lbs. and its extra lumbar support, the Echelon Breathable Mesh Office Chair provides a superior ergonomic fit. It comes standard with a molded foam tractor seat and is available in a seemingly limitless selection of upholstery options to meet your individual style. truly unique design. The narrow upper back shell encourages a “shoulders back” posture, which is the way the body was naturally designed to sit. Body-cradling thoracic support is created by adding a special thoracic ridge for optimal comfort. With a tractor seat included as a standard feature, your body will feel the difference this line of comfortable computer chairs has to offer. Last but certainly not least is the ever popular Internet Office Chair with it's timeless good looks and it's best seller rating. In fact, the Internet Series Chair has been RFM's top seller since it's introduction! This unique line offers three back sizes (Medium, Managers High and Executive High Back) each with a non-cascading seat for better comfort. The series rounds out its versatility by offering an adjustable stool which complements multiple work settings. The lumbar foam provides extra back support and make the Internet a Good Fit for Every Body. Needless to say this line of high quality desk chairs is built to last in terms of looks and ergonomic quality. 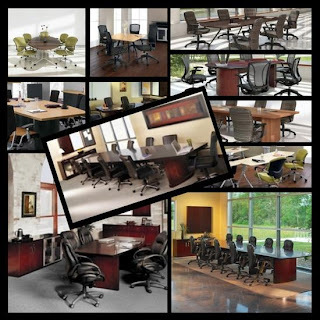 If you're looking for a line of professional office chairs to compliment any of the industries top office desks or business office furniture, the Internet collection is definitely a great place to start your search! Creating a stylish boardroom for your business is essential. This how to article shares awesome tips and product suggestions that will ensure your boardroom is not the bore room! By utilizing modern furniture and incorporating matching accent furniture such as presentation aids, you can design the meeting are of your dreams on a shoe string budget. It's important to design a boardroom that showcases your business personality. If you want your employees and visitors to be awake during your presentations, it's essential to create a modern space that's engaging. This process involves the utilization of modern conference room furniture to build a well rounded space with ample wow factor. Often, consumers hear the word modern and immediately think expensive. It's definitely true that cutting edge products can come with a budget killing price tag. However, with a little bit of homework and product knowledge you can have a modern boardroom to be proud of at a budget any business can afford. Several industry leading office furniture manufacturers specialize in manufacturing high end conference furniture solutions for modern spaces. Mayline, Global Total Office, and OFM are just a few of the hottest brands right now. The good news is, they all offer affordable products any budget will appreciate! Using an elliptical conference table is one cool way to keep your project on the contemporary track. This unique shape is ideal for spaces of any size. If this look strikes your fancy, Global Total Office is the brand for you! This respected manufacturer provides more modern conference tables than any other brand in the business. In addition, modular conference tables are also an excellent way to highlight ingenuity while providing the ever important wow factor mentioned above! Modular office tables allow spaces of any size to be easily transformed for multi use applications. These space saving office tables define innovation and Global definitely manufacturers their fair share. Consider this brand for any boardroom makeover project! Sitting around a table and talking is a great way to bounce around ideas. However, it's not the most effective. Visual learners need interactive ways to engage themselves in group activities and reach their highest levels of productivity. For this reason, using presentation aids in the boardroom is an absolute essential. Products of this nature will enhance the style of your conference area while improving the overall quality of your business meetings. Presentation aids such as lecterns and presentation boards are by far the most popular. These two products should be staple pieces in any professional boardroom. An enclosed marker board will provide excellent visuals while a modern lectern will help keep listeners focused on important presentations and even speeches. All of the top office furniture providers listed above offer matching presentation aids for their boardroom tables that won't exhaust your project funds. Don't forget the little things! Minor touches and accent furniture will make a huge difference in the overall appeal of your boardroom. Products like modern wall cabinets as well as complimentary wall art will pull your space together. Laminate or wood bookcases will offer excellent storage while potted plants with cool containers will breathe life and color into your conference room. As an added bonus, several of the presentation aids listed above also server as excellent accent products. These versatile products are all perfect examples of value meeting need! Working with an interior design team isn't always necessary, but can be a huge help in terms of inspiration. Consulting with office furniture professionals who specialize in conference tables will also arm you with additional product knowledge that's invaluable during the shopping process. By setting a budget, comparison shopping products, and working with industry professionals, you can easily create a stylish boardroom that will look good for years to come. Staying organized is an important part of operating any business successfully. From filing cabinets to office shelving, a seemingly limitless selection of products are available to meet these needs. That being said, not all office storage solutions are created equal! This article highlights the absolute best products to keep your office properly organized and working effectively in 2013. When it comes to discount executive furniture solutions for the home and business, nobody beats Offices To Go. This top manufacturer offers a host of awesome products sure to have your workspace looking fantastic and within budget. 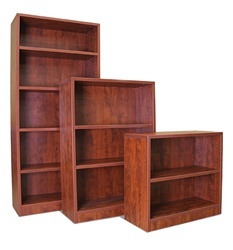 As for storage, their wood bookcases are an excellent way to save money without sacrificing style and quality. With several top models offered, units like the SL71BC 4 shelf executive bookcase are always a great choice for keeping those important price guides and training materials neat. Available in 3 laminate finish options, this product is truly an excellent value at only $269.99. 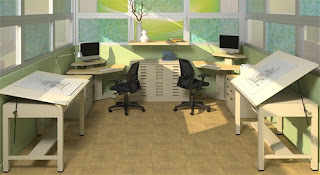 With products like these, It's no wonder why Offices To Go is such a popular furniture choice for 2013. 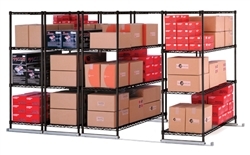 One main area of any business that's always in need of space saving products that aid in organization is the warehouse. The OFM office furniture brand took this need to heart when they introduced the x5 Shelving line several years ago. The popularity of this modular shelving line has grown each year, and for good reason! These easy to use, shelving sets are affordable and very well made. Stand alone wire shelving units are offered as well as larger mobile shelving packages for areas with more square footage. The scratch-resistant powder-coated paint finish on shelves and chrome-plated accessories add to the good looks x5 has to offer. Talk about versatility! 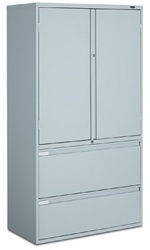 The Global Total Office manufacturer really outdid themselves when they created the 9300 series of metal storage cabinets for the workplace. Products from the popular line form the perfect combination sure to meet your wardrobe storage and filing needs quickly and effectively. Units like the 9336P-5MSL metal office storage cabinet, save space while keeping your files and important office products organized. These units typically ship assembled and offer matching locks for an easy and secured solution to your office needs. 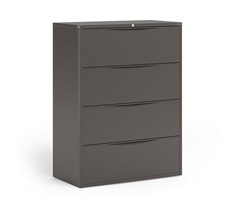 The most popular of all office storage products is without a doubt the file cabinet. This eternal product is used in nearly every business worldwide. Mayline, a respected manufacturer of lateral file cabinets for the home and business offers some of the hottest solutions on the market. The CSII metal lateral filing cabinet line is by far their most popular. 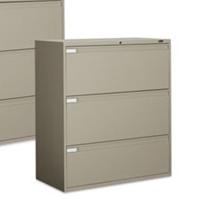 These locking file cabinets offer a modern look and durable construction that's sure to last a lifetime. As with most Mayline Products, CSII cabinet solutions are from a matching collection of office desks and modular workstations that can create an entire office of professional office furniture that's sure to impress. Typically stocked in 4 colors, the CSII filing products line boasts solutions in a variety of sizes to meet the needs of any space.